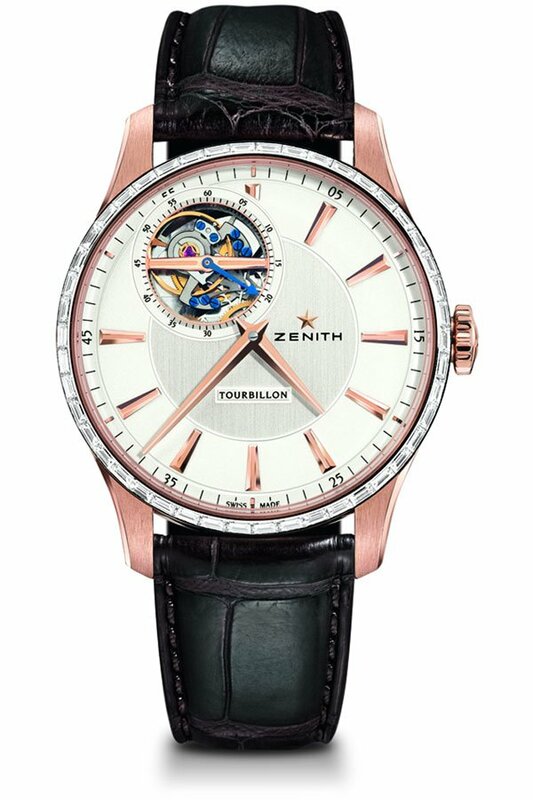 Zenith, a watchmaker with over a century’s worth of history, that has been recognized as one of the leading movement makers, has launched a new Tourbillon for its Captain collection. The watch showcases the complexities that have kept Zenith timepieces popular throughout the years. The great precision of this highly functional watch is matched by its elegant and beautiful aesthetics. The Captain Tourbillon is encased in a 40 millimeters case that comes in either a rose gold or 18K white gold. The gem-set version of this watch comes in a case with a bezel adorned with 46 baguette-cut diamonds. This classic shaped case has a nice refined curve. What makes it unique however is its asymmetrical dial design. The brushed silver-toned dial features dauphine-style hands and markers that are reminiscent of its 1950s Captain watches. The design of the dial attracts ones attention towards the tourbillon’s rotating carriage. The off-centered rotating carriage incorporates a small seconds hand and performs one rotation per minute. The transparent sapphire crystal case-back allows one to observe the movement that powers this watch. This El Primero 4041 S movement is made of 199 parts and the world’s only tourbillon that beats at a frequency of 36,000 vibrations per hour, which is much faster and more efficient than the typical 28,800 vibrations per hour observed with other watches. Finishing: Oscillating weight with “Côtes de Genève” pattern. Swiss luxury watchmaker Zenith was formed with the vision of George Favre-Jacot in 1865 who imagined creating the most reliable and accurate watches in the world by housing all of the various manufacturers of a timepiece in one place. By having all of the different watch manufacturing part experts in one place, Favre-Jacot envisioned having total control of all parts and instruments. This idea later came to fruition as Zenith came to be one of the most highly regarded and most precise watchmakers ever with over 2,000 awards and over 300 patents filed. Zenith is one of the few luxury watch manufacturers that fosters and crafts their entire timepiece from start to finish. Being one of the elite groups that are in control of each phase of production, you can expect to get only the best in design and function with the most accurate movements. 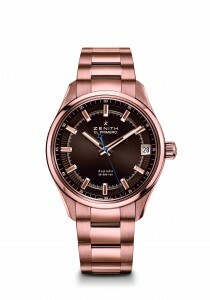 Zenith’s collection of watches overall are very minimalist yet powerful in both appearance and performance. Their latest release, the Christophe Colomb Skeleton is no exception. The Christophe Colomb Skeleton was created after years of concentrated research and development and pays tribute to both the famed explorer Christopher Columbus and their own Lépine chronometer movement known as the “Echappement Colomb.” Together, these two concepts resulted in a revolutionary timepiece that can defy the effects of gravity on the timepiece by keeping the mechanism horizontal at all times regardless of the wearer’s movements thereby keeping the most accurate time possible. The Christophe Colomb Skeleton utilizes a centuries old technology called the Cardan suspension system which was frequently used in gyroscopes in the past. The Skeleton is a limited edition version of the original Christophe Colombe timepiece which was created with the same Cardan suspension system. Although the two watches bear some similarities, the Skeleton vastly differs from the original when it comes to appearance. The Christophe Colomb Skeleton appears just as you would expect the bare bones or framework of a watch to look like. The Skeleton has a 45-millimeter platinum case, blue steel hands and sapphire dials which can all be clearly and beautifully seen through the skeleton dial. collector with a proclivity for innovation yet appreciate old world expertise, the Christophe Colomb Skeleton is a perfect match. You can always trust Zenith to be at the top of its game. With the Zenith Espada, the famous watch maker continues their upward climb with their latest release in their El Primero line. Powered by the El Primero 4650b with a whopping fifty hour power reserve, the Zenith Espada packs a powerful punch. The automatic movement makes keeping this watch running right on time as effortless as the design of the timepiece. Zenith has always relied on its sterling, yet simple, design principles to craft watches that are stunning in its effortless style. Offered in four variations, all of the versions are easy to read with accented indexes in rose gold and silver and your choice of stainless steel or alligator bracelets. The solid hands of the watches are easy to spot in the polished dials of the timepieces, while the starred accent on the second hand add a subtle detail to the watch. One version even features diamond indexes—Zenith’s only accession to opulence. Whatever the accents, each variation still features the same elegantly understated design. The watch also has a date function, which is easily visible, but won’t distract you while telling the time. The Zenith Espada crafts their whole watches to fit together like an elegant puzzle piece—nothing juts out of place but all works together to create a pleasing picture. Zenith needs no limited editions, no over-hyped products sold by celebs to sell their watches. With a dedication to fine watches and years of delivering on their ideals, Zenith watches practically sell themselves. Their secret? Zenith is one of the few watch makers that manufacture all their pieces from top to bottom. With scratch resistant sapphire for the dial window and a 24 month warranty, you won’t have to worry about this watch being high maintenance. The watch is also water resistant up to 100 meters, or 330 feet, making it a good choice for those who want a more durable watch. 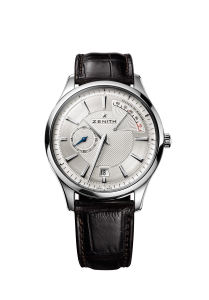 By committing themselves to great movement, easy readability, and classic design, the Zenith lines stand out above the rest. For those who are looking for quality that’s one-of-a-kind and a reputation as sterling as their watches themselves, Zenith is the answer. The Zenith Esapada is no exception to the watch designer’s legacy with solid simplicity and flawless technology. With a few more watches like this, Zenith’s name is sure to be written in the stars. In today’s world of overloaded, gaudy accessories, the Zenith Elite Captain stands out for its striking simplicity. Zenith watches, founded in 1865, have taken a sure but steady road to the top of Swiss watch making. Praised for their mechanical precision and flawless finishing, the watch designer is certainly among the top watch makers in the world. Zenith’s Elite series has outdone itself with the intelligent design and forward thinking. Their previous designs have sported invisible windows to reveal the inner mechanics of the watch, but the Zenith Elite Captain removes the distracting elements of the watch and presents the flawless execution of their design in its place. For most watches, this simple design would be boring, but the extreme attention to the flawless, graceful lines of the watch turn simplicity into a work of art. The silver sunray dial meshes perfecting with rose gold accents for the indexes and the curved sapphire glass, treated for anti-reflection on both sides provides a clear window into the time. The automatic movement is crafted with the same excellence included in all Zenith watches and includes hours, minutes, central seconds, and date functions. The fifty hour power reserve adds to the functionality of this watch, though the low water resistance (only 50 m/165 ft) means that you won’t want to take this watch swimming, or even a heavy rain. However, the dark brown rubberized alligator strap is sure to outlast whatever activities you put it through. If the alligator strap isn’t your type, you can swap it for the stainless steel bracelet. The alternative colors on the steel bracelet provide a subtle effect on the eye. 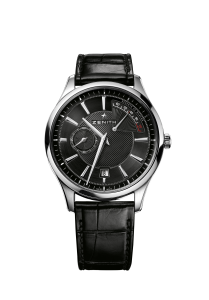 In the stainless steel version of the watch, the rose good accents are replaced with silver and the silver sunray dial is replaced with a black sunray version. Both versions provide a subtle contrast that complements the simplicity of the watch, but also maintains the readability of the watch. If you prefer numerals on your dial, the watch may have some issues, but the clearly marked indexes on the open face combined with the bold hands of the watch make this watch not only easy to read, but a pleasure as well. The Zenith brand is continually producing watches at the very highest of standards. 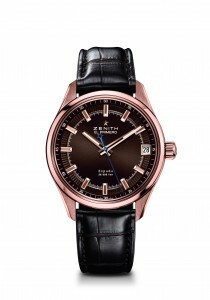 The Zenith Elite Captain is no exception to Zenith’s rule of outstanding products. Whether this brand is at the pinnacle of their success is hard to say—for the Zenith’s past 150 years prove that the brand may still be on its way up. Zenith has captured the adventurous spirit of exploration in its Christophe Colomb timepiece. This inspiring complex yet exquisitely designed timepiece embodies Manufacture Zeniths’ historical developmental journey of its precision Lépine chronometer movement, which was manufactured at the beginning of the 20th century. This 201/2” NVI chronometer, whose escapement was known as the “Echappement Colomb” (Columbus Escapement), received three First Prize awards from the Neuchâtel Observatory and an “Especially Good Class A Certificate” from the Kew Observatory, Teddington. Precision, it is all about precision at Manufacture Zenith. A century after Christopher Colombus’ amazing New World discovery, a shipboard compass that featured a precision “Cardan suspension” on gimbals system, a type of universal joint in a shaft that enables it to rotate when out of alignment, developed to enhanced maritime navigation. This system was instrumental to a ships survival out at sea, as ships were affected by the gravitational effects of rolling waves that constantly altered ships navigation. This Cardan suspension system was subsequently used to equip marine chronometers and inspired Manufacture Zenith to incorporate this very same system of complex precision technology in its designed tourbillon movement for its Christophe Colomb wrist watch. Christophe Colomb impressive features boasts a silver dial housed in white, rose or yellow 45 mm diameter case with black lacquered indexes and numerals and blue stainless steel minute, hour and indicator hands. The hours and minutes are ex-centered at 12 o’clock, the self-regulating gyroscopic module is at 6 o’clock, and the second display is at 9 o’clock with the power reserve indicator at 3 o’clock. It showcases a box-form sapphire crystal with anti-reflection treatments on both sides and excrescent domes cover the gyroscopic module. 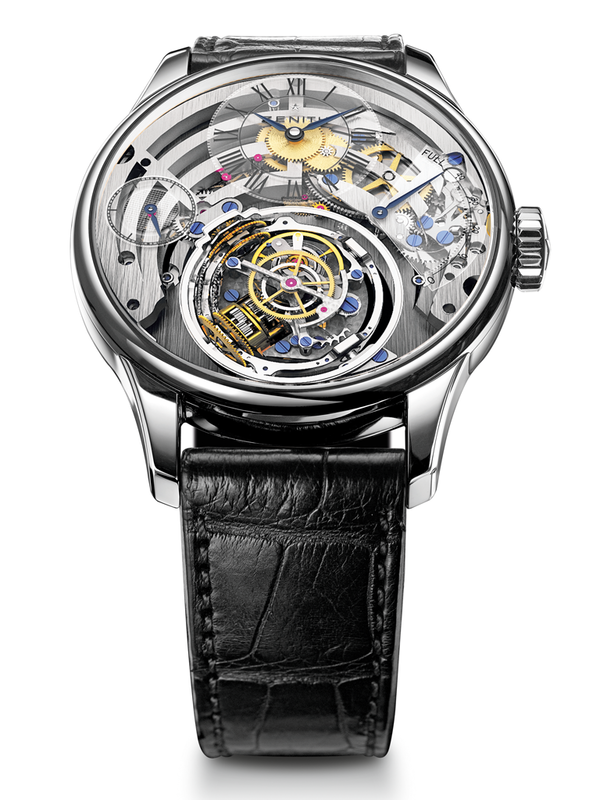 The movement is Academy 8804, manual, consisting of a unique gyroscopic system which maintains perfect horizontal positioning of the regulating organ (the tourbillon). The caged tourbillon consists of 166 components, 10 conical geared wheels which has six spherical wheels and six ball bearings. Five years went into the development and daring complications of the 166 components housed inside the 3D-like gyroscopic module –referred to as its regulating organ as well as its movement beating at 10 vibrations per second. Manufacture Zenith has brilliantly produced the first wrist watch in which the rate is entirely independent of the wearers’ movements – impressive. The Christophe Colomb timepiece marks a major milestone for Manufacture Zenith as well as the watch making industry. 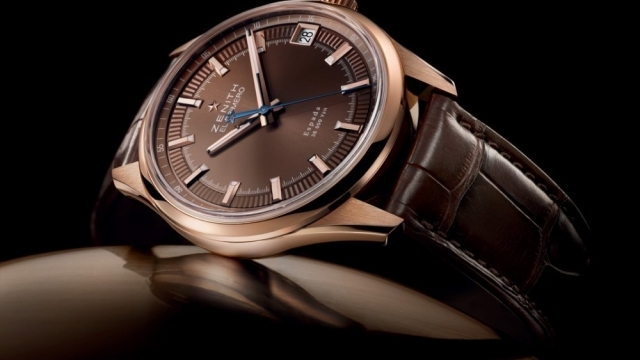 It is an exceptionally limited edition timepiece, having only 25 pieces each in white, rose or yellow gold. It is destined to become a legendary iconic timepiece for Manufacture Zenith and for connoisseurs that purchase this inspiring yet elegantly made instrument.